The White Ranch offers some of the World's finest Kobe-Style cattle, the most Heart Healthy beef known. This wonderfully unique type of meat is also unchallenged as the world's most flavorful. Careful and caring pasture management programs allow The White Ranch to provide Gluten Free, Natural, Grass Fed, Free Range Cattle to meet the growing demands of health conscience consumers. NO Hormones, Antibiotics or Steroids are needed because of the nutritious green grasses on the open ranges of the ranch. The healthy vegetarian diet of The White Ranch cattle naturally have a much lower ratio of saturated to unsaturated fatty acids. These super healthy cattle evolved from a complex percentage cross program involving the best English Hereford, Red and Black Angus, Florida Brahman, Wagyu (Kobe), and Galloway foundation traits. 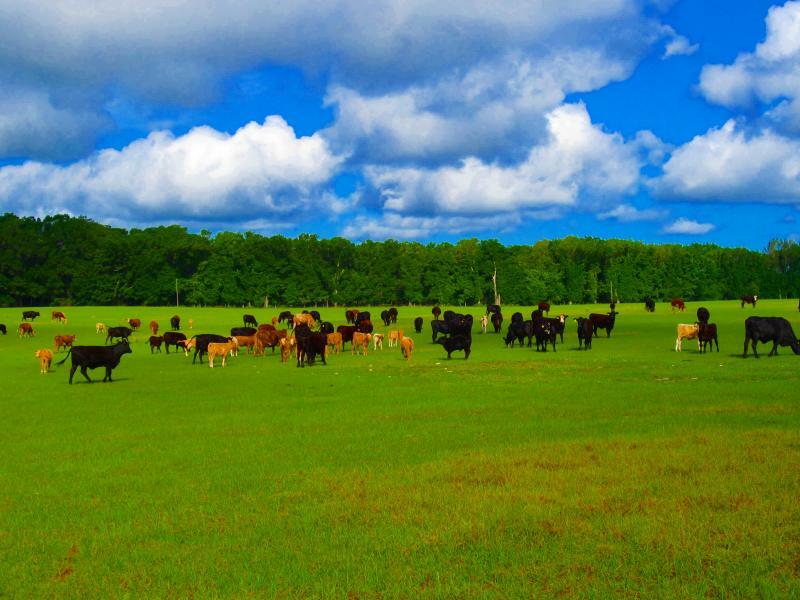 These cattle are truly the world's first specifically designed to be 100% grass fed here on Florida's natural range grasses and produce some of the world's most superior beef using full circle sustainable farming practices. This beef contains a much higher proportion of the very desirable monounsaturated fats than other beef. The monounsaturated to saturated fat ratio is up to three times higher than in any other breed. Research results from Pennsylvania State University published in the American Journal of Clinical Nutrition, concluded that eating monounsaturated fatty acids is better for your heart than eating special diets with lean products. The research also shows that Kobe-Style meat can actually help to reduce cholesterol levels. The predominant fats in this unique beef are oleic and linoleic acids which are unsaturated facts. There is less cholesterol and palmetic acid in Kobe-Style beef which are the predominant high cholesterol fats found in British and European cattle meat. Consuming The White Ranch Signature Heart Heathy Kobe-Style Beef is considered very beneficial to your health, possessing a uniquely high concentration of the beneficial omega 3 and omega 6 fatty acids. In addition to being hugely beneficial to heart health, these extremely important omega linolenic acids improve immune resistance, help with vision, and protect tissues from arthritis. Other known areas of benefit include protection against Alzheimer's, and high-blood pressure (hypertension: the leading cause of stroke). The University of Wisconsin researchers discovered that certain fats found in meat contain a substance with anti-cancer properties. This substance is also thought to combat arteriosclerosis. These effects can be attributed to CLA (conjugated linoleic acid), which occurs mainly in monounsaturated fatty acids such as olive oil and The White Ranch Signature Heart Healthy Kobe-Style Beef. 500% more of the anti-cancer CLA (conjugated linoleic acid). The White's Heart Healthy Kobe-Style Beef with a moderate marbling score has a fat content of a mere 6%. As the meat is cooked the fat content melts, resulting in a final product with around 4% fat content. Any product with a fat content of less than 10% will be endorsed by the Australian Heart Foundation. In conclusion, researchers Dr. D.K. Lunt and Dr. S.B. Smith, of Texas A&M University had this to say about heart healthy Kobe-Style (Wagyu) beef, "The ability of Wagyu beef to deposit less saturated and more unsaturated fatty acids produces a beef product that can be consumed by heart patients and others who avoid eating meat because of a fear of consuming saturated fats. The possiblity that meat with superior eating quality and a more desirable unsaturated to saturated fat composition leads us to wonder if we may really have our cake and eat it too." The purebred DNA lines that produced The White Ranch Signature Heart Healthy Kobe-Style Beef have received these Distinguished International Awards. The White Ranch main herd bull FC Itomichitak has a achieved a 14-Star ranking on the GeneSTAR system. This is the highest score possible, only one other bull in all of world history has been ranked that high. The sire of The White Ranch main herd bull is FC Itomichisuru FB 6441. This 7-Star bull combines the Tajima bloodlines of the # 1 and 2 marbling bulls: a double-cross of Michifuku, JVP Fukutsuru 068 and TF Itomichi 1/2. This bull contains a Marbling Quality Grade Score of 20, also the world's highest grade. 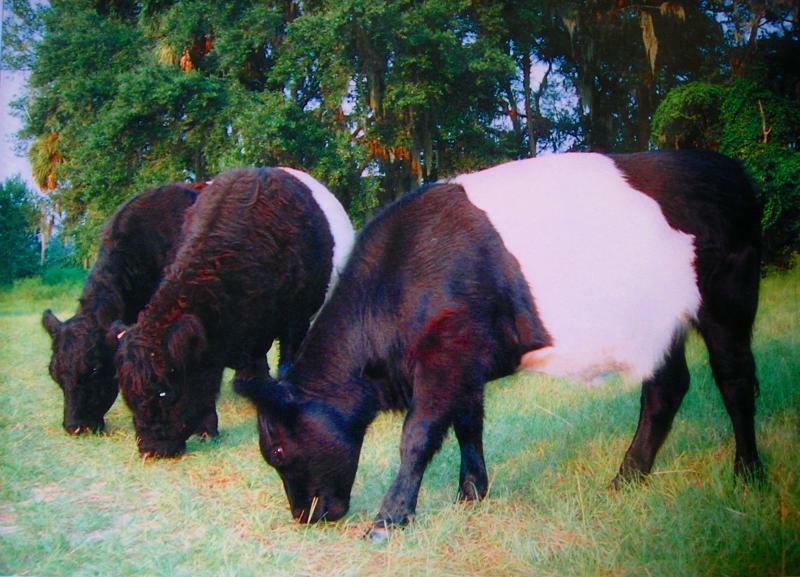 The full blood Belted Galloway on The White Ranch have sire ancestry from Shiralee Moonshine B313 (Australia). Sire Okiwa Nelson 662 (New Zealand), dam Midfern Panda (B576). He was a black bull of classic conformation and proportion. Yearling wt. 1058 lbs., 50" hip ht. At three years 1930 lbs., 55" hip ht. 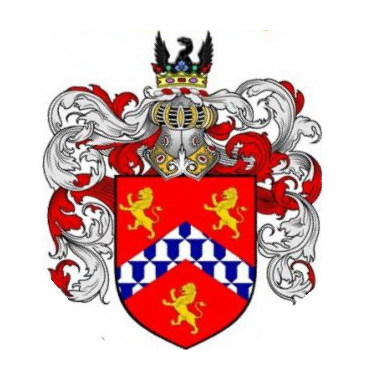 Our Galloway dam ancestry comes from Sir Winston Churchill's Belted herd at Blenheim Palace, Woodstock, Oxfordshire, England, United Kingdom.